As hundreds of thousands of activists across the country gather at March For Our Lives rallies to demand tighter gun control laws, a group of Second Amendment enthusiasts is planning a protest of its own. According to the "March For Our Guns" website, the movement was created by citizens "who will no longer risk the leftist agenda of seizing the opportunity to diminish our abilities to keep and bear arms." "Politicians are correct in telling us that now is not the time to talk about guns," wrote the movement's organizers. "March For Our Guns is in 100% agreement. Alarmist leftist rhetoric should not take the guns from law-abiding youth that use the firearms to hunt and provide for their families." 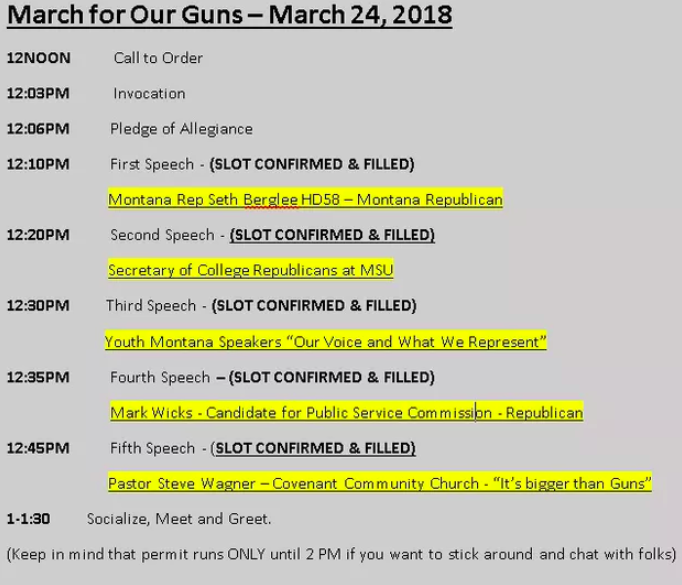 The provided agenda for the counterprotest, which is set to begin at 12 p.m. MDT, or 2 p.m. EST, includes a call to order, a recitation of the Pledge of Allegiance and speeches from Montana Representative Seth Berglee and a group of youth speakers, among others. Joey Chester, an 18-year-old College Republican at Montana State University who is slated to speak at the pro-gun rights rally, told NPR that organizers have said they expect a turn out of 500 people or more. "I think it's going to be a pretty big crowd," he said. In contrast, it is estimated that over 500,000 will partake in the March for Our Lives rally in Washington, D.C, alone.